This my first submission for the Analogue Hobbies Painting Challenge. They have netted me 150 points, 7% of the way to my my goal! 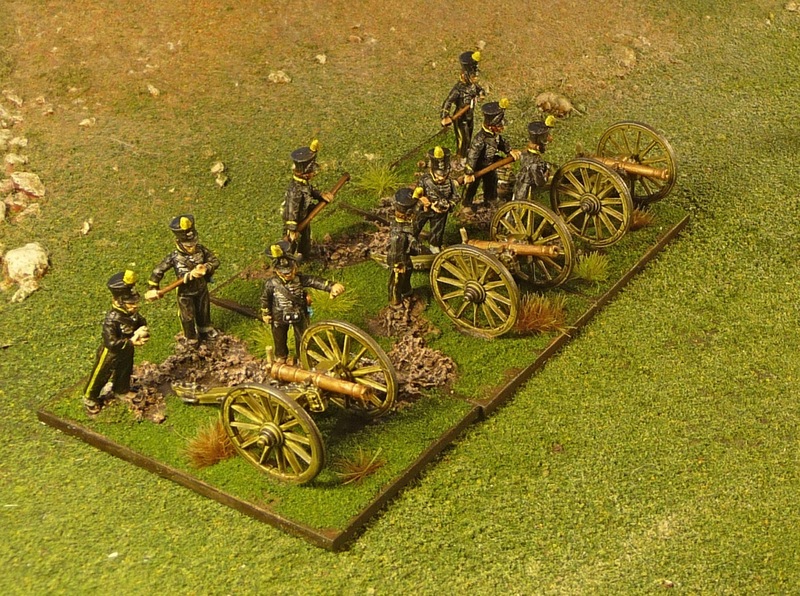 They are from the excellent Perry Brothers Brunswick 28 mm collection. Nothing at all wrong with these figures, no complaint and easy to paint. I used the same technique as the Lieb Battalion, white prime with Vallejo Black Ink Airbrush followed by two progressively lighter greys from the Vallejo Model Colour range. I was using a Citadel Yellow, but I found the Vallejo Lemon Yellow had better coverage over black. 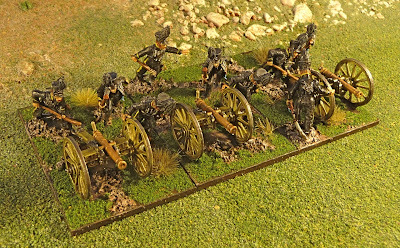 I am using a Prussian Dark Blue on the unit I am painting now as the first dry brush, you will have to say what you think when I post them. 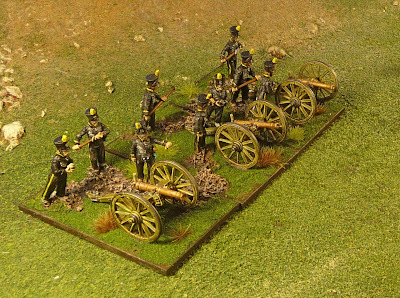 The Brunswick Corps had 2 Artillery batteries, one Foot Artillery unit under Major von Moll and one Horse Artillery unit under Captain von Heinemann. Both units were comprised of six 6 pd cannon, I use a ratio of 1 base for 2 actual cannon, so here we have 6 bases. My research indicates that the equipment were captured French or Westphalian cannon, so I have gone with an olive green colour for the woodwork. The Horse Artillery have similar uniforms as the Hussars but with yellow facings. 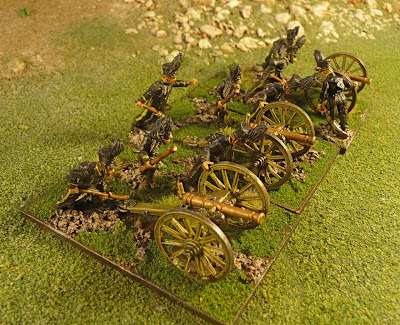 I probably could have done a little better job of selecting the figures, most but not all these figures appear to be running up the guns in order to position them. Looking good, John. One suggestion - on the guns, consider painting the bore of the cannon mouth black. I think it really improves the look of the field pieces. You are right Peter, I was just noticing it, I believe I should pin vice them out a bit as well. 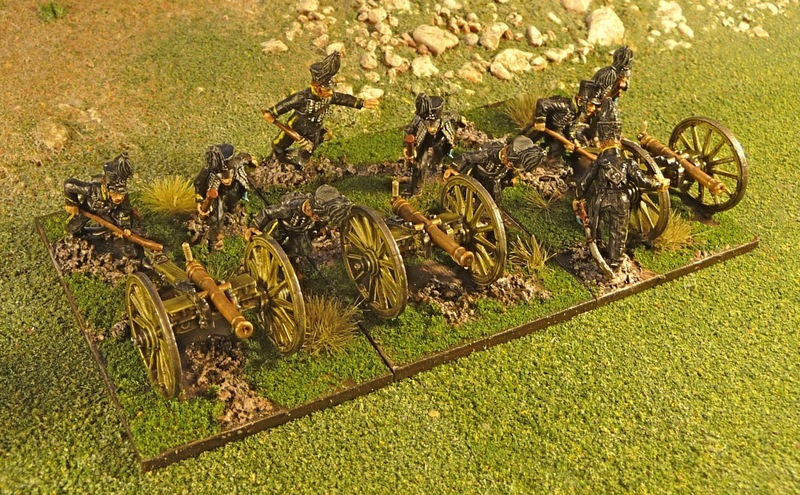 Great looking artillery and crews but my eye is drawn to the backdrop in the first picture. The hill with the wall running along the top and buildings in the distance is a wonderful piece of terrain. These are fantastic John! Lovely photos. Hi there and Happy Christmas. I love your stuff and the speedy enthusiasm with which you produce unit after battery after regiment - amazing! Just one gripe - drill out the cannon barrels or simply pop a blob of black paint in there - makes all the difference to me! BTW… I found the P3 "Sulphoric Yellow" offers a great coverage over any colour. John they look really good. Just a few things that can make them look even better - use a solid black wash (i.e. undiluted) on your gun barrels, particularly the gun mouth maybe even a spot of black down the barrel. I use Coat d'arms # 169 Super Wash Black - I think its one of the best black ink washes around. Don't worry if you use too much, just highlight the raised areas in bronze again - the contrast will make it look even better. 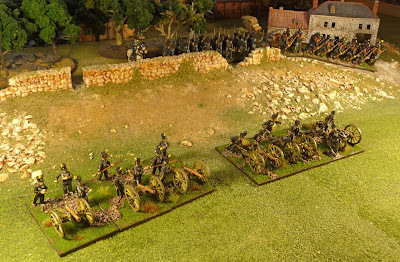 The same principle applies with the gunner's shako plumes - dry-brush highlight them in grey. You can use the same wash again to tone it down a bit after highlighting if need be but the end result will really make the plumes stand out. Really great guns and crews - a nice start to the paint comp! Merry Christmas to you and yours John. A good start to the comp John, that's some fast painting right there! Keep it up! Very nice and tight battery.